goal1- Access instance from public network cloud users. goal3- To avoid connection block of instance. 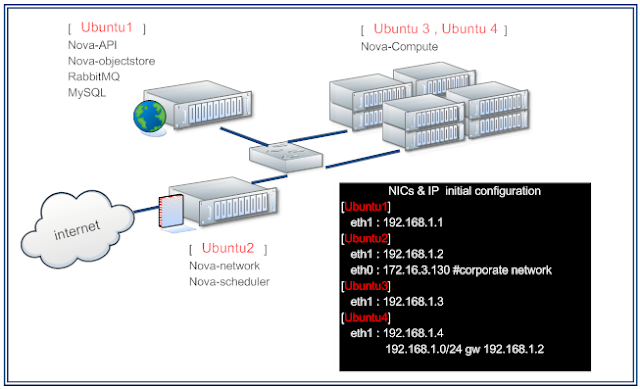 In regular way , instance route from nova-network host. Once nova-network dead , users will lose connection to instance. 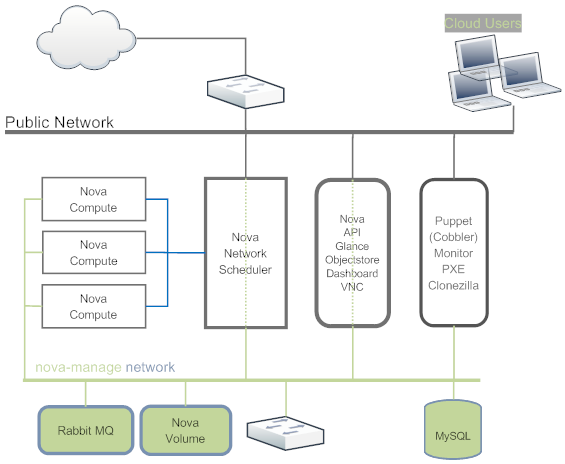 goal4- High availability of all services , especially nova-api & nova-network. goal5- Monitor NOVA hosts and instances. Instance vnet nics bridge to gray network , direct connect to public network. In same network with cloud users , do not cross any gateway. But in my test , instance failed to get correct metadata from api server. Error Code: 404 not found . I have no idea now. And another problem is two DHCP servers in public network. If nova-network fail to work , instances still accessible . This is the best one now. Hope that has opportunity to figure out above issues. In this topology , I'm confusing about " which network should be flat_network for NOVA? " How to assign EC2 url ? Is there any network collision ? Due to our purpose that instance should be accessible anytime , I'm thinking about HA of Nova-network hosts. But there's some bottleneck , the gateway of instance must on nova-network at boot up section for fetching metadata from API server . Nova-network redirects 169.254.169.254 request to Nova-api server. How could I control instance to route from two or more nova-network hosts? Regular HA solution? Plz message for any idea.